Concentricity Gage - Precision Gage Co. Measuring parts without centers can be a challenge. 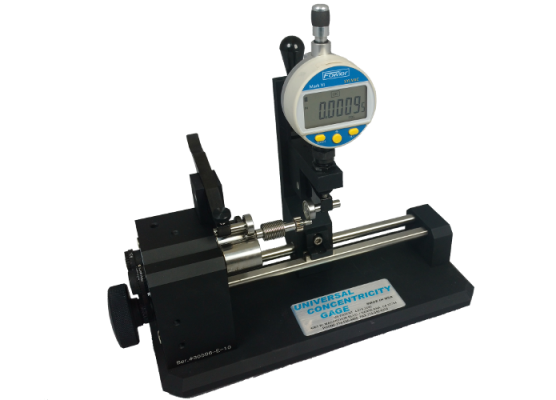 Our concentricity gage solution makes it easy. Typically, when a part is measured between centers, assumptions must be made based upon how the features of the part are supposed to function. By locating a part by its datum diameter and measuring the concentricity directly, all assumptions are eliminated. The result is a measurement that meets the print with confidence. Accurate and reliable measurements are key in today’s competitive manufacturing environment. Universal’s patented Concentricity Gaging Systems offer less than 2 microns accuracy, which has been proven in a variety of industrial applications. Continuous improvements to its modular design adapts to customer requirements and provides the flexibility necessary for maintaining quality.